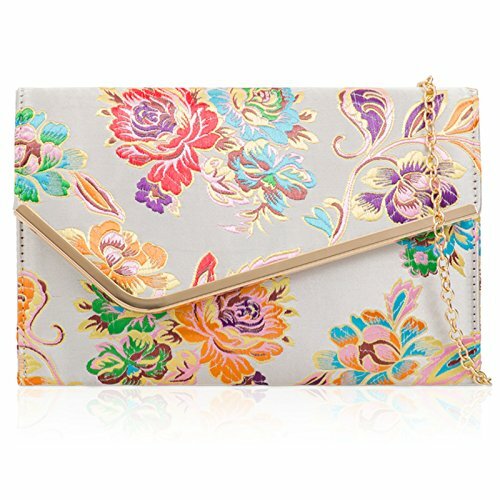 CLUTCH SIZE: Width:25 x Depth:2 x Height:16 cm - FLAT LIGHTWEIGHT BRIDAL BAG WITH MULTI COLOURED FLORAL EMBROIDERY ENDS WITH GOLD TONE METAL BAR. LONG CHAIN STRAP: 120 cm / 48 inches ; Gold Coloured | Rust free | Fits all sizes and easy to carry cross the body. MATERIAL: Satin Fabric with Jacquard floral pattern.